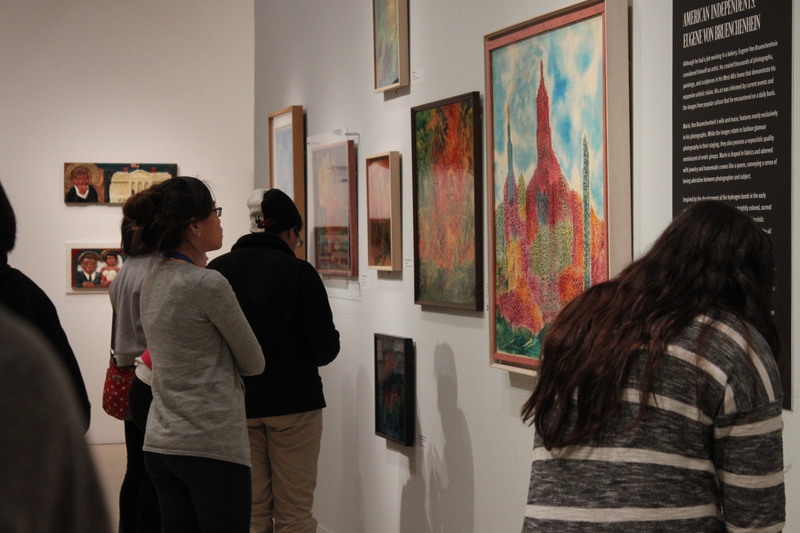 For my internship with the Satellite High School program, Chelsea, my supervisor, let me organize the elementary school visits, where our teens taught much younger students about art in our collection. 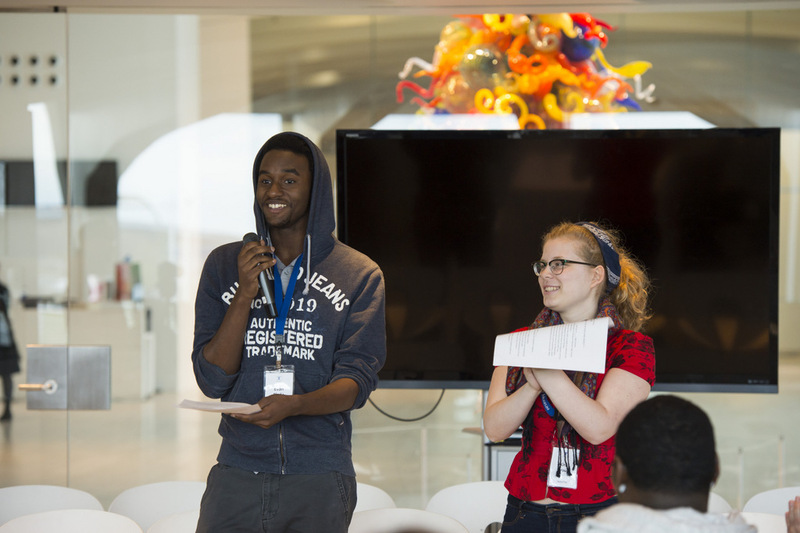 The teen interns work with students from Milwaukee Public Schools Community Learning Centers (CLCs) to introduce them to the Museum Collection and the feature exhibition. This was a challenging yet rewarding experience to manage! As an upcoming art educator myself, I found I had to take into account different layers of teaching. I first only thought about the lesson I would teach to the teens–meaning I would show them what exactly we would be doing with the kids. But soon I realized the extra layer–that the teens would then be teaching the younger students. So essentially, I was teaching how to teach. In order to get the high school students comfortable with the idea of teaching younger students about the Collection, I had them test out some activities I designed for them to use as a template of what they could do with their elementary school group. I struggled coming up with these activities at first. In the past, when I’ve taught a lesson with the teens, I’ve always had some sort of big idea or end objective I want the students to achieve, then I struggle when students stray too far off from the objective. Something very important that I’ve been learning at the Museum is to be a flexible practitioner: to build your lessons around letting the students guide instruction. An objective is fine, but it is also important to be highly aware of the language I am choosing to use when instructing, as well as gauging my students’ interest in the lesson. Because the elementary school students would only be at the Museum for an hour, we wanted to make the absolute most of it. I used the Museum’s Family Guide as a source of ideas. Thinking about how I could best show the teens how to work with students, I modeled the activities for them as if I was the teen and they were the elementary students. I think it was important for the teens to run through these activities with me before trying them out with their kids. It prepped them to better understand the activities and to form more relevant connections. After my demonstration, I led a discussion with our students about what we should keep in mind when working with younger students. I was pleasantly surprised with what the teens shared: that it’s important to be able to “go with the flow” if something doesn’t work out as planned, to show that you are excited and passionate in order to engage the kids, to allow them to decide what they want to do (or choose the artwork to do the activity with), and to always be more prepared than you need to be. These are lessons that I am still reminding myself to follow! 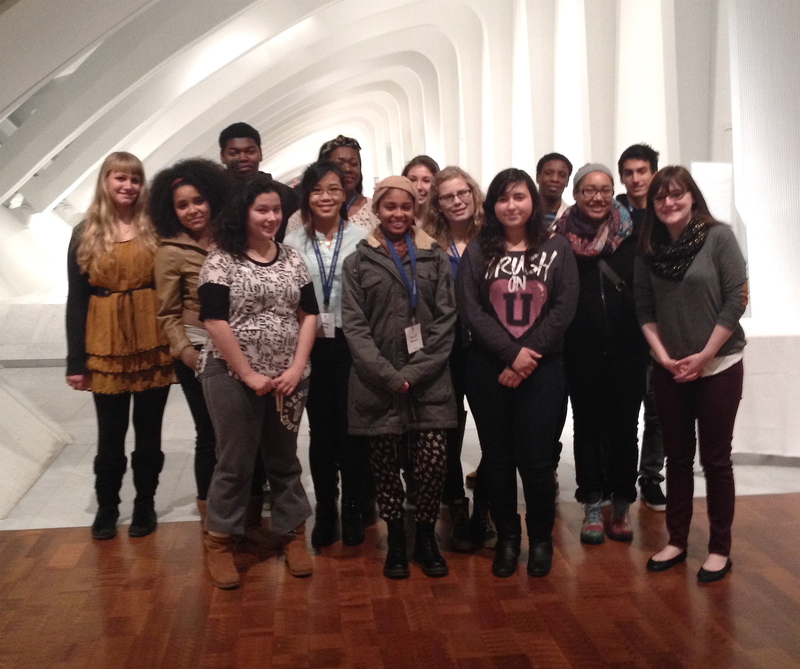 I have learned so much about education from my internship at the Milwaukee Art Museum. I’ve learned to be more confident in myself as a teacher: When I am uncertain about something, I try not to hesitate. I’ve learned to speak louder, and also to be more sensitive with my word choice. There are so many things to simultaneously juggle when you’re teaching – the content of what you’re working to get across, being an observant listener while thinking about what you’re going to say next, making sure everyone is engaged, making sure everyone understands, making sure you’re being heard (physically and figuratively)… It’s a lot! Practice really does make perfect when it comes to teaching. The more experience I gain, the more comfortable I am. I witnessed the teens going through the exact same realizations as they worked with the younger students. And in our three short CLC visits, I also observed our students make great improvements at becoming more confident and taking control as young educators. For them to share with others their love for the world of art (at such a young age themselves), and to hear them say to the elementary schoolers, “Well, art can be whatever you want it to be. What do you think?” made me even more aware of how important it is to continue to share art in today’s world, and how lucky I am to be a part of this integral process. This entry was posted in Behind the Scenes, Education and tagged college interns, education, Interns, Teen Programs. Bookmark the permalink.